Si miramos esta foto desde un punto de vista artístico estaríamos ante una buena foto, quizás incluso una muy buena foto. Si vemos lo que documenta, un bombardeo en Londres en la Segunda Guerra Mundial, estaríamos ante la memoria, el recuerdo de un hecho dramático en una guerra de millones de muertos. ....The present Cathedral, the masterpiece of Britain's most famous architect Sir Christopher Wren, is at least the fourth to have stood on the site. It was built between 1675 and 1710, after its predecessor was destroyed in the Great Fire of London, and services began in 1697. This was the first cathedral to be built after the English Reformation in the sixteenth-century, when Henry VIII removed the Church of England from the jurisdiction of the Pope and the Crown took control of the life of the church. The three hundred year old building is therefore a relative newcomer to a site which has witnessed Christian Worship for over one thousand four hundred years. 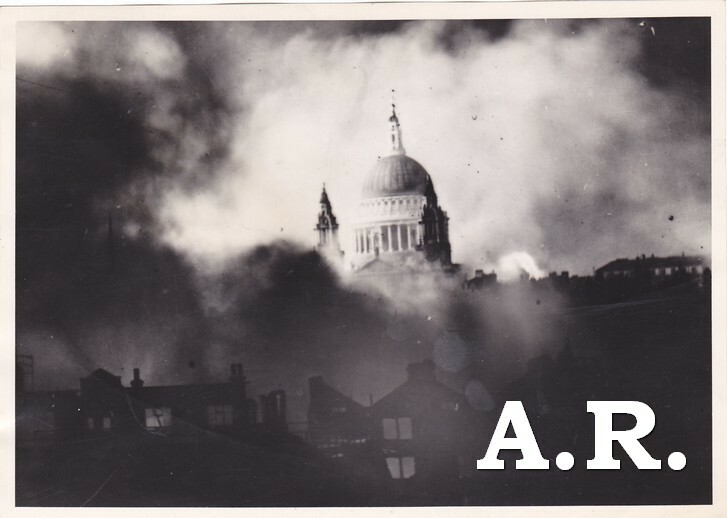 This brief history looks at just a few of the individuals and events which have shaped the history of St Paul’s Cathedral..
During the Battle of Britain, the German Luftwaffe launches a heavy nighttime air raid on London. The dome of St. Paul's Cathedral was pierced by a Nazi bomb, leaving the high altar in ruin. It was one of the few occasions that the 17th-century cathedral suffered significant damage during Germany's nearly ceaseless bombing raids on London in the fall of 1940. If we look at this photo from an artistic point of view we would have a good shot, maybe even a good picture.If we see what documents, a bombing in London in World War II, this would be the memory, the memory of a dramatic event a million war dead. News agencies and weeklies. Both paid staff worked as free-lance. Arise in the 30s, and the oldest in France is the Alliance Photo, created and directed in 1934 by Maria Eisner, who then direct Magnum. Part of this project Capa, Chim, Denise Bellon, Pierre Boucher, Pierre Verger, René Zuber, Émeric Feher and Henri Cartier-Bresson. Werner Bischof and then join Ernst Haas. The United States created in 1935 the agency Black Star. After the war Apis, Dalmas and add Reporters Associés.The founders could produce substantive issues or "big weeklies" that were very successful.The Picture Post devoted to Robert Capa in 1938 at age 25 as the photographer's most important world war. The Rapho Agency in Paris in 1933. They work for her Robert Doisneau, Willy Ronis, Janine Niepce, Serge Sazo, Suzanne Fournier. His photos are used for business, advertising ... Most photographers are humanists.These agencies live largely from reselling your files. The Second World War was documented on a huge scale by Thousands of photographers and artists WHO created millions of pictures. American military photographers Representing all of the armed services covered the battlefronts around the world. Every activity of the war was Depicted - training, combat, support services, and much more. On the home front, the war many federal agencies produced and collected pictures, posters, and cartoons on Such subjects as war production, rationing, and civilian relocation. Photographic archives in Spain are rich in quantity and quality .... Collection of World War I: Agency BUFA and Associated Illustration (4,000). 3. ...... In the second decade of the century it remained intense relationship with.